Several years ago when I was taking one of my Goddess History classes at OSC, I drove through my town as I often do and past the “Millenium Arch,” a commemorative sculpture that was created and installed on the local university’s campus in 2000 (this is also my alma mater for my BA —it is an engineering school, known for its programs in science and technology. I was a psychology major, but it was still an awesome program). 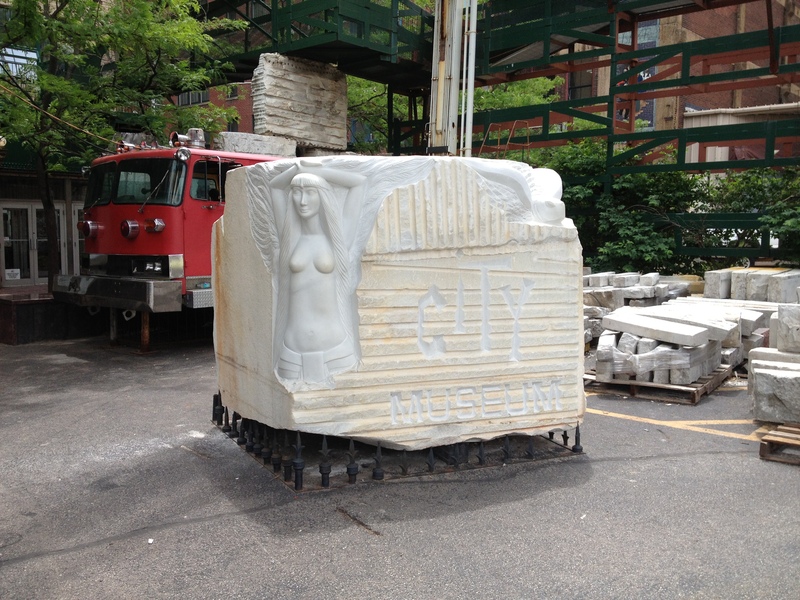 I’ve thought it before, but I was struck again that this is, to me, a Goddess sculpture, right in the middle of town, right in the middle of campus. Indeed, it is on one of the main, most-traveled roads in town, meaning that many people every day are in the presence of a Goddess figure, whether they recognize it as such or not. We explored in that class how there are “hidden” Goddess/Goddess imagery in many places and I think this is an awesome example. 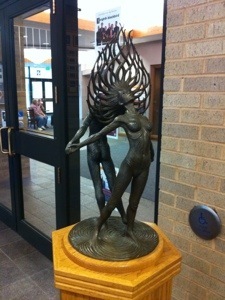 The theater on campus uses a sketch of this sculpture as their logo also. Here is a link to some more photos that were taken of it as part of a photo contest. 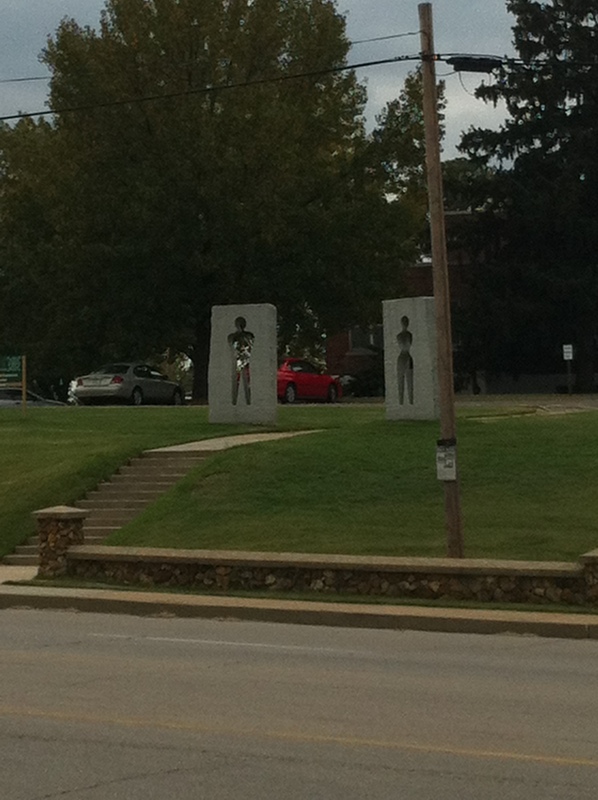 If you can’t see very well in the picture, there are stylized cutouts of a woman and man in the arch and then the figures themselves stand beyond the arch. I looked up the artist and she has done other large art pieces including, Christa, a female Christ on the cross figure, and also an Eve and the apple installation. So, I think she knew what she was doing! As a side note, this campus also has a half-scale model of Stonehenge on campus carved of granite by engineering students. At the time of its construction it was accurate as clock to within 15 seconds. It sits next to a major highway and anyone can stop and walk through it if they wish. I didn’t know until I was writing this and checked the school’s website, but the “megalith was dedicated on June 20, 1984, on the summer solstice, by a Druid Priest.” Looks like I chose the right school for my undergraduate work! As Podos says on page 309 (this is excerpted from my lesson and I’m not actually sure to which page 309 it is referring), “…goddess figures have been found dating as far back as 25,000 years [further now] before the birth of Christ. 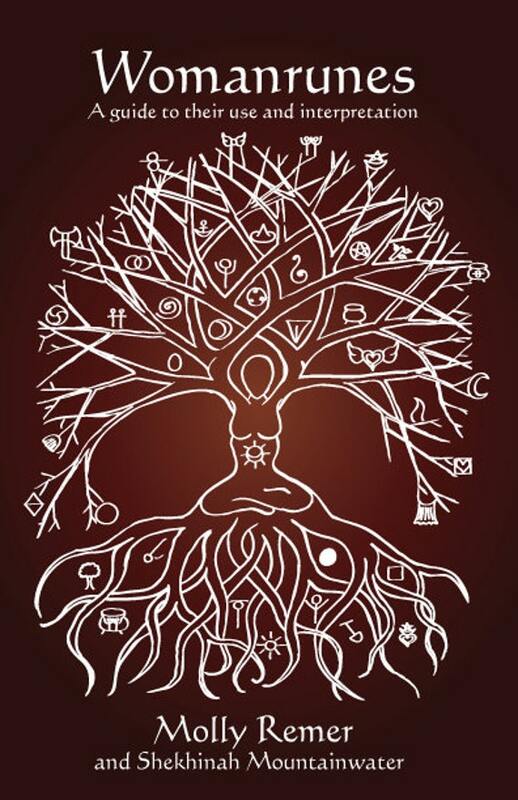 We know that throughout the ancient world cultures were built and sustained on a belief in the Great Goddess in Her many and various aspects. We know that remnants of Her worship exist throughout the world today despite the many recurrent efforts made to destroy Her power…We know that the memory of Her and the memory of women as free and powerful being lives on, even though it is often buried so deeply that it no longer reaches out to us.” I think She reaches out to all of the people and students in my town from this university campus sculpture! 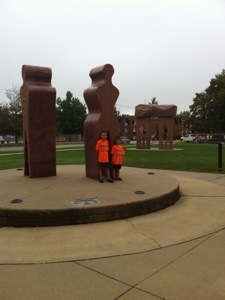 My boys by the figures before seeing a show on campus. 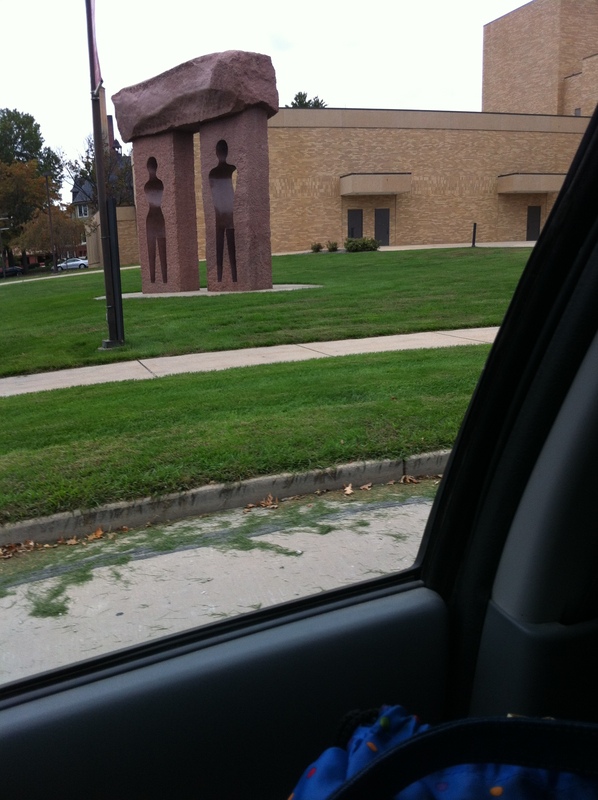 A smaller, related version is on the grounds of another campus building on another highly traveled road. In the lobby of the theater. 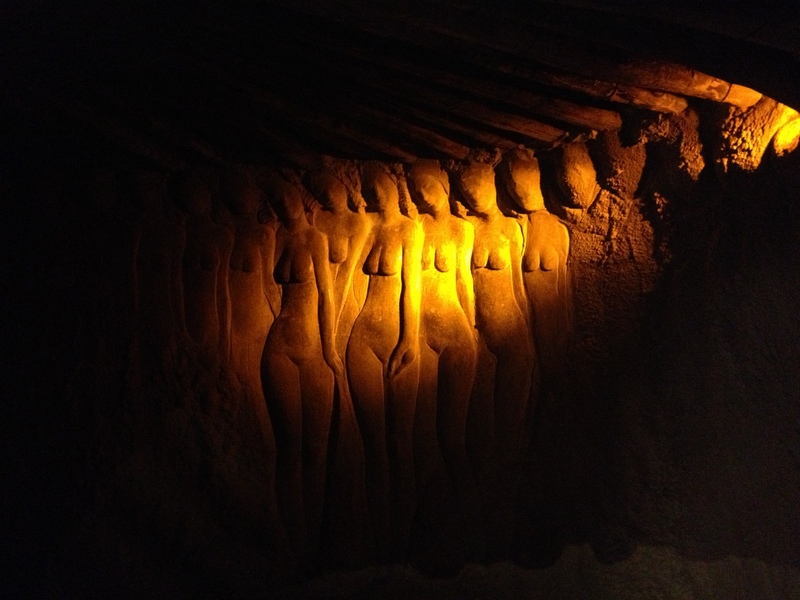 This past week I took my kids on a field trip to City Museum in St. Louis where I was pleased as can be to discover some awesome goddesses in plain sight there as well (well, actually down in a cool cave-type structure). City Museum is basically a huge indoor playground for kids. This carved wall is in the “cave” section and really surprised me when we came across it! I took pictures of at least four different goddess-type sculptures/art while there (and there were more—like big mermaids on the floor of the main hall, but my phone ran out of battery and I couldn’t take pictures of them all). This is not typical museum with displays and artifacts or anything, it is an explore-and-play kids museum, so I wasn’t expecting cool goddess art! By one of the slides. Looking down at the dragons and goddess cave. Fabulous – thank you so much. I am ridiculously excited for you Molly! 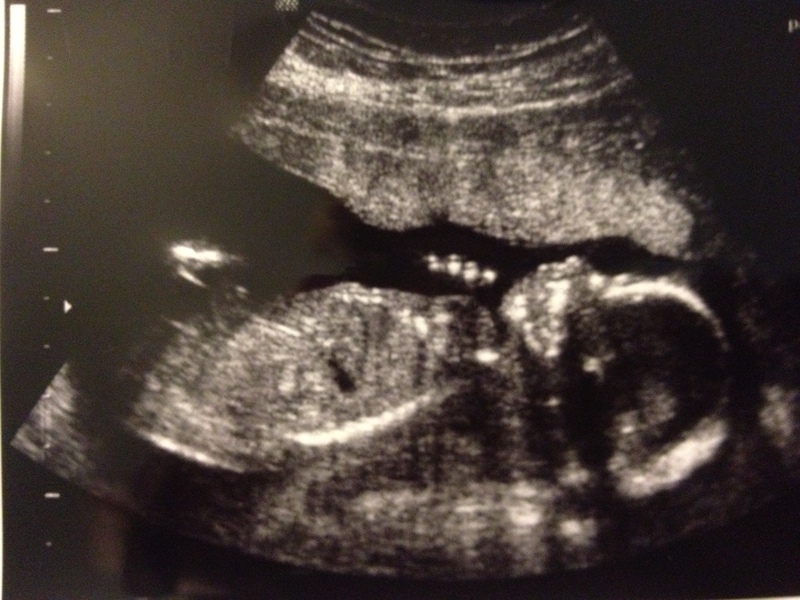 Huge congratulations on the next member of your family!